HARD HITTING DETROIT LIONS FORUM - View topic - Who starts at SSLB, and how does he fare? Who starts at SSLB, and how does he fare? I say Ashlee Palmer, finishing with 105 tackles, 1 sack, 1 INT, 9 missed tackles. Also, why not move Tulloch to WSLB and Levy to middle? I think this is a good idea if Levy continues improving. Re: Who starts at SSLB, and how does he fare? I agree with the Palmer thing, not the Levy/Tulloch thing. Palmer, 85 tackles, 0 sacks, 1 int., and he struggles horribly in coverage... We don't blitz much, I don't see that changing. In two years here Durant had 1.5 sacks, less than 1 per year. I'd like to see film of the "sacks" that he did have. I'd bet they were pretty close to the LOS, and possibly even Qb runs. Ronnell Lewis, 91 tackles, 3 sacks, 2 INTs, 4 FF. 9 roughness penalties. I have never viewed him as a DE. I just think he's the meanest guy on the roster and perhaps the most versatile. I'd love to see that kind of prodution from him. Me too. Minus the roughness penalties. Id take a chance with him. Wish training camp was here so we can have an idea who they are trying out at the position. If the coaches see him as a true starter, id think they would make him ease up, and play aggressie coverage so he picks up PIs instead of roughing. As long as the roughing comes after the game has been sealed in the Lions favor or doesn't cost the game.. I can live with them. Maybe it will bring back some swagger to the defense. I want what yer smokin! play like like in what would basically be his rookie year in an off position would make him an all pro hall of famer guy! I think Whitehead will take the job and be slightly below average overall this season but with a chance to develop into a nice coverage player. Palmer will play in short yardage and resume his special teams role. I see Ronnel Lewis as an edge pass rusher not a 4-3 OLB with primarily coverage responsibilities, that means he s a DE for the 2013 Detroit Lions who could make the rotation ahead of Devin Taylor if Lewis can breakthrough on special teams. The LBing unit was awful last year and will clearly be the sore spot this year. The LBers will make the DL look bad as well. I actually think its the other way around. The way the Lions ask the DL to do their job does no favors to the LB unit, which admittedly has less talent. IMO it is a fundamental flaw with the design of this team defensively. They have used high draft picks and bigger veteran acquisitions on the DL (Suh/Fairley/Ansah and KVB/C. Williams/now J. Jones) but they dont ask these players to play a complete game. 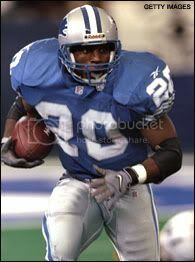 You would think if a player is drafted in top 5, top 15 of the draft or gets big free agent money that such a player would be talented enough to be disruptive in both the run and pass games but this defense is schemed to rushing the passer and the Lions coaching staff have not demonstrated a desire to alter this approach which has been exposed ever since the 2011 San Francisco game (Week 6). When the DL is playing with less responsibilities it becomes very easy for the offensive play design and blocking scheme to cause the Lions d-linemen to take themselves out of the play entirely and leaving extra blockers to attack the Lions LB corp. Based on this design, I would think it would work better with more resources dumped into the LB and CBs for run support (the ends seem to crash inside more than contain) and the DL would be composed of more mid round level talent with specific skill sets slanted towards passrushing and somewhat deficient in the run game. Why this team has Fairley and Suh, both shutdown capable players inside but asks them to play one-dimensionally is beyond me. IMO the Lions play stupid football defensively and its really not Gunther Cunningham's fault, its more a poor combination of Schwartz scheme and Mayhew's way of filling the roster for that scheme. Constructed correctly the scheme could work and alternatively, the same talent collection could probably be more effective playing a different scheme.